John Clendenin, on the snow in Aspen. If you’re hoping to up your downhill game by letting an instructor more or less convince you to suspend pretty much everything you’ve ever learned about skiing, you may as well go to Aspen to do it. 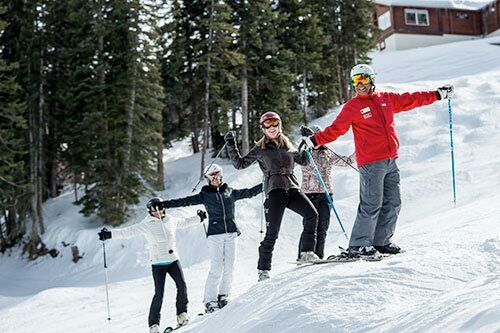 True, you can have the same experience under the guidance of the very same instructor at other resorts in the U.S. as well as in the French Alps and the Chilean Andes – let’s just say the guy’s in demand – but Aspen is his home, Aspen mountain is special indeed, and he knows it very well. The “he” in question is John Clendenin, and a more irrepressibly charming and energetic ski instructor you’re not ever likely to meet. Now entering his seventh decade, he still exudes some of the wild, devil-may-care enthusiasm that doubtlessly fired him up in his younger days when he notched two world championships in Freestyle Skiing. In 2013 the U.S. Ski and Snowboard Hall of Fame inducted him – as much for his winning smile, you suspect, as for his medals and impact on the sport. Perhaps most notably, Clendenin says his method is rooted in a philosophy slightly different from most others. “This isn’t about maximizing speed,” he says. “It’s about managing speed.” Speed, he continues, can mask bad or flawed technique. 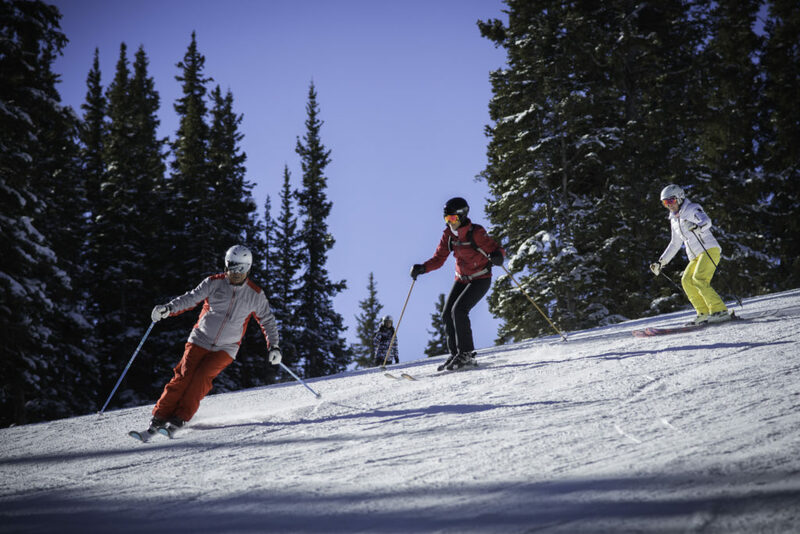 Put another way, if you can manage your speed on all terrain – i.e., stay in control – you’re on your way to expert skiing. 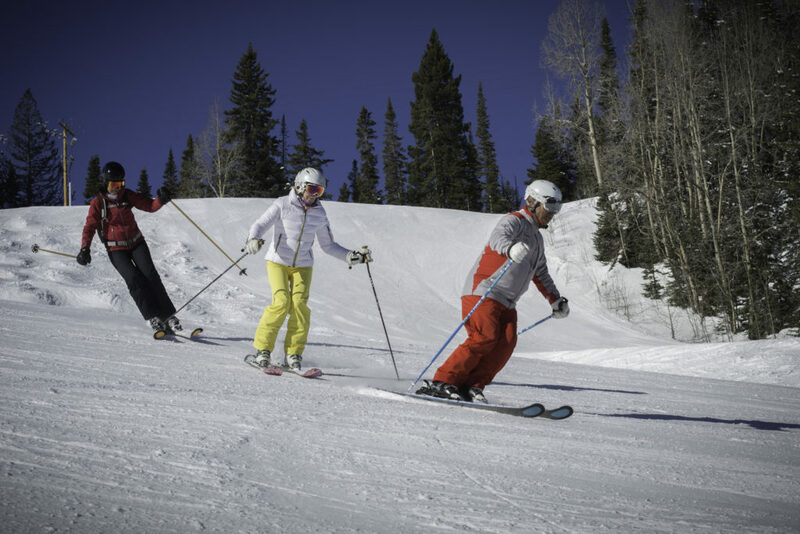 Endorsers of the Clendenin Method have included fellow skiing legends – not to mention Olympic gold medalists – Jonny Moseley and Stein Eriksen. All I can say is I’ve spent a fair amount of time in ski schools and clinics taking variations on the same techniques and ideas, and they’ve helped me look pretty good on groomed slopes. Not so on other terrain, especially moguls, even after being shown how to adjust for them. Then I gave one of Clendenin’s three-day camps a shot. I’ve never before felt like I learned so much, experienced more confidence, and eventually had so much fun – even though I had to rethink a lot of what I’d previously been told. (Weight on the downhill ski? Ah, no…) More to the point, by the end I was managing to get through mogul fields not just safely, but actually with a bit of style. 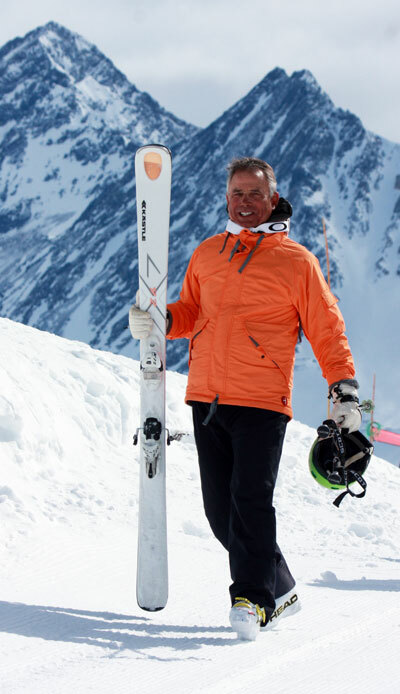 “About 80 to 90 percent of skiers are skiing only maybe 20 percent of the mountain,” Clendenin is fond of pointing out. Blue groomers can be fun, he acknowledges, but as the day wears on, so do the pistes, and by afternoon a once-gorgeous and open groomer can become chewed up and crowded. His goal, as he puts it, is to give you “the keys to the Kingdom,” meaning the ability and confidence to use the same techniques to ski the entire mountain, on any terrain, in all conditions. “You have to let go of your ego a little,” Clendenin says. “We move in baby steps here, and we go right back to the basics.” Why? Because skier’s flu results from the primal fear of falling, which prompts stemming – “an instinctive survival technique for turning,” he says. If you don’t transcend that fear, you’ll never experience the liberating benefits of “dancing with gravity,” as he puts it. And touching, tipping, drifting and centering are the steps to that dance. Following the turns of Clendenin down the mountain. 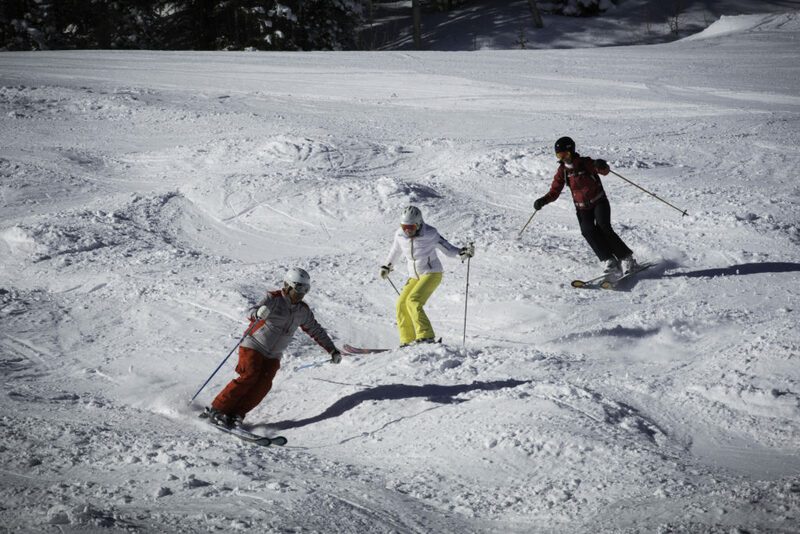 Touch – Using poles to signal/cue the start of a turn (not, as is often the case in stemming, to help shift weight from the downhill/inside ski to the uphill/outside ski). Tip – Releasing edges and committing to gravity, the beginning of transferring the bulk of your weight from the uphill ski to the downhill one. Don’t even think about carving. Drift – A squeegee-like move in the middle part of the turn, weight evenly distributed. Center – Balancing after the last part of turn, with more than 50 percent of your weight now on the (newly) uphill ski. Along the way we picked up key terms such as “the love spot,” “the epiphany pad,” and “the Killy hands” (as in another Olympic champ, Jean-Claude Killy, whose skiing style has inspired Clendenin). At times it felt like we were learning a new language as much as anything else. I also discovered how bad my case of skier’s flu was – worse than I thought. It really became apparent that afternoon when we moved onto a moderately moguled slope. Theoretically and intellectually, Clendenin’s words were making sense, but getting the feet, knees, hands, and torso to execute accordingly felt counterintuitive, as evidenced by several tumbles I took. I wasn’t riding the moguls; the moguls were riding me. I wasn’t the only one, though. And Clendenin, while quick to note what I was doing wrong, was full of encouragement, assuring me he could also see how I was getting the right idea, if not always the right result. “It’s all in your feet,” he kept saying. “It all starts in your feet.” After repeating it so many times, there was sometimes an unspoken undertone of, “You do know what your feet are, right?” But then he’d flash that smile, and I was laughing with him. Day two was more of the same, including gorgeous sunshine everywhere, except almost the entire time we spent on mogul fields, returning to groomers only whenever he felt we needed a refresher on anything. Physically, it was demanding for me. Even though fewer things were going wrong for me in the moguls, it doesn’t take much to make muscles burn and scream in that environment. I finished the day sore, but also with a sense of improvement – not a breakthrough of any sort, but definitely having advanced another baby step or two. My breakthrough was, fittingly, on the last day. In the last hours, in fact. I still had to consciously make myself initiate and execute the four words, but they were beginning to make sense to my feet, not just my head. The problem was the last part, centering. I was coming out of turns with the uphill ski too far ahead of the downhill one – not a great way to maintain speed control. So I modified “Center” in my mind to “Pull back!”, meaning remember to pull back the uphill ski at the end of the turn. And it worked. Man, did it work! I was hardly looking like grace itself, but I was starting to string together not just one or two but several turns in the moguls with a fair amount of ease and success. And with a lot less effort. Moment of triumph with John Clendenin. To be honest, I still didn’t think I was looking particularly great, but Clendenin had the video cameras working that afternoon. In the bar of the Hyatt, celebrating completion of camp, the videos were shown – and there I was, looking like I actually knew what I was doing, and Clendenin applauding me. Later, he sent me the video with his commentary showing what I was doing right, and what I should continue to work on. About half of everyone in the camp with me were repeat customers; one guy said it was his seventh time. And they all told me the same reason why – every time they take it, they learn something more, something new. And Clendenin’s love for what he does is infectious, making you want to keep working with him. I know exactly what they mean. 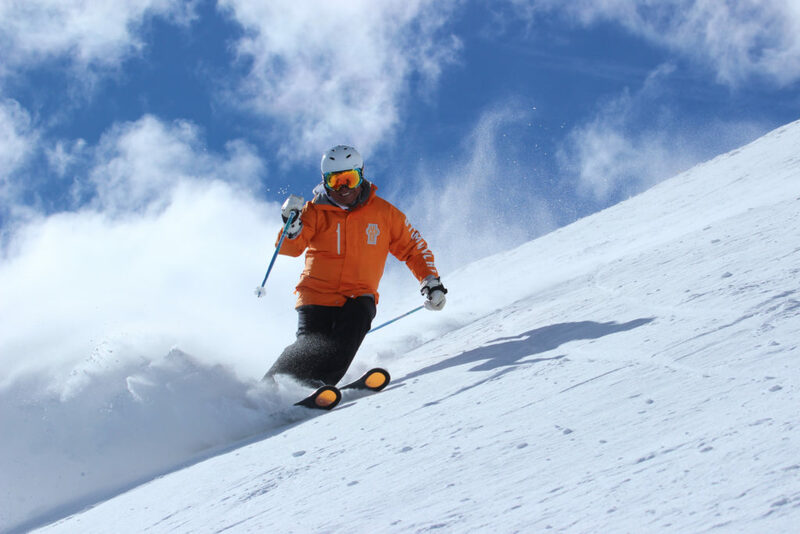 Visit the Clendenin Method for information about this winter’s camps in Aspen, Park City and Steamboat and a summer camp in Portillo, Chile. William C. Triplett is the former DC bureau chief for Variety. Triplett has written about various destinations, from Scotland’s Inverness and Paris’s Pere Lachaise Cemetery to Shakespeare’s Stratford-upon-Avon and the Beatles’ old haunts in Hamburg. 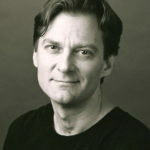 His work has appeared in The Washington Post, The Daily Beast, The Baltimore Sun,and Capital Style.